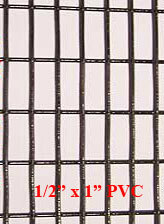 Standard Mesh 1" x 2" 14 gauge PVC coated (Black) wire rolls 100 feet long. Sold in whole rolls only. 24 inches wide x 100 ft. long. 36 inches wide x 100 ft. long.